Lexus has been teasing us about the their hoverboard for quite some time now. Earlier in June, they released a very short teaser video that left many wondering whether it was real or not. Now, they have released a full-length video featuring the very-real hoverboard and the incredible process behind creating it. But why did it take so long? Well as many people might have guessed, it really isn’t all that easy to make a levitating skate board. First of all, Lexus had to build their own special skatepark for the hoverboard. It looks just like a regular skatepark but actually features 656 ft of magnetic track underneath the surface to help the hoverboard lift up off the ground. Meaning, unless there is something magnetic underneath the hoverboard, it simply won’t work. As Design Engine had explained earlier in June , the hoverboard uses superconductors and magnets to hover. The steam that comes off from the hoverboard is liquid nitrogen, which cools the superconductors to -321 degrees Fahrenheit – the temperature at which they become superconducting. If you want to learn more about the process that it took to create the Lexus hoverboard you can check out the video below. Sadly, the Lexus hoverboard is not for sale now, nor will it be in the future. As many have suspected earlier, the hoverboard is part of a marketing campaign for Lexus. 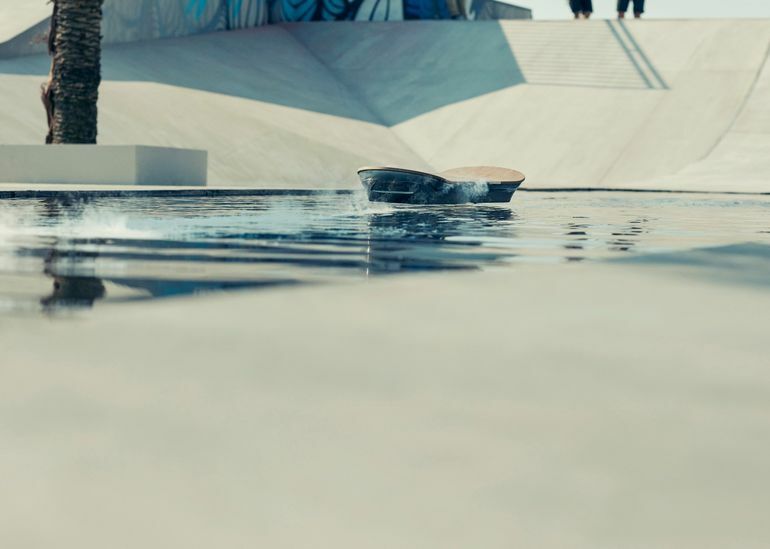 The design of the hoverboard is just what we would expect from Lexus, but the fact that it doesn’t work anywhere else than at their own magnetic skatepark makes it a little less cool – but, nonetheless, fun to look at. The video below showcases the hoverboard in action. On it, professional skateboarder Ross McGouran shows off classic skateboard moves, but not without taking a couple spills. Maybe the hoverboard isn’t easy to ride? What do you guys think of the Lexus hoverboard, was the final video worth all the hype?